Sorry for not posting recently we`ve had a lot of work. There is plenty of new material in the pipeline. The photos for this photo video were taken in the City of Kashgar in the Province of Xinjiang, Western China. They were taken during two visits; the first time in November 1990 (not 1999 as we mistakenly put on the video) and the second in August 2002. 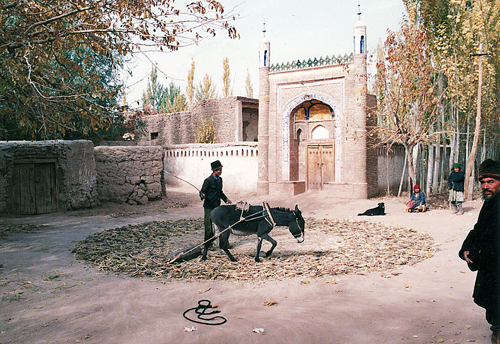 In 1990 the center of Kashgar was dominated by the old mud brick Uyghur city with the large Id kah Mosque and the huge adjacent square at its center. Apart from the huge statue of Mao and a few empty department stores the Han Chinese presence was small. The only tourism was made up of travelers heading to and from Pakistan. By 2002 things had already changed a lot. A modern Chinese city had built up around the old historic city and cars had predominately replaced donkeys and horses. Chinese tourists and western tour groups were also arriving in large numbers especially for the Sunday Market. The fascinating animal market had been moved out to a tamer location on the outskirts of town. Getting to and from Kashgar was now easy and comfortable by plane or train. The 3 day bus journeys to Urumqi or Turpan a thing of the past. Interestingly individual travelers were few and far between due to the political situation in Pakistan. Since 2002, much of the old city has been demolished and been replaced by the sterile white tile buildings that can be found all over China and much of Asia for that matter. What remains has become a tourist zone with a ticket to enter. 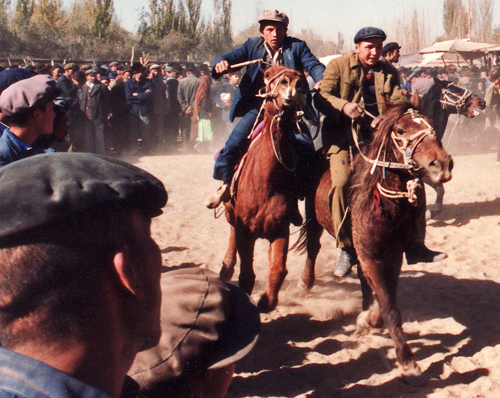 The images you’ll see on the video will not be seen again in Kashgar, especially the photos from 1990. We apologize for the quality of some of the photos as the cameras we used we cheap and some of the negatives are slightly damaged. 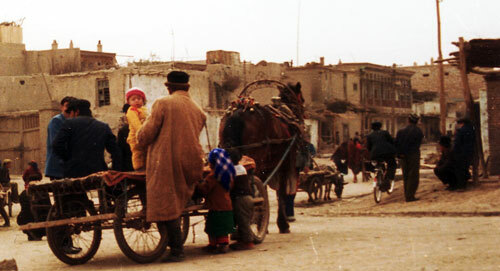 However, we hope you’ll enjoy seeing what Kashgar was once like. 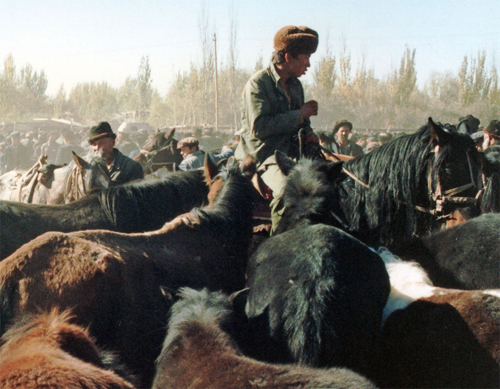 Finally, all cities and places change; and we’d still recommend visiting to Kashgar. The people are warm and friendly and the Sunday Market continues to bustle, it has just adapted to the 21st century and even now Kashgar remains a melting pot of people from all over the region and the world. We hope to go back soon.